The ecosystem and long-term thinking property owners share a common interest of reducing the energy consumption. This connection leads to an interesting new investment field for investors. In Germany, the majority of buildings was built between 1950 and 1980. Since that was a time of low energy prices, most of these buildings have a pretty high energy consumption. In times of sharply rising energy costs people are looking for solutions to lower their heating bills. 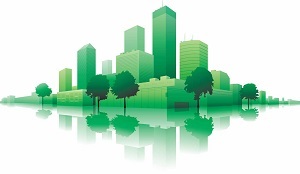 Due to the markets changing demand in favour of sustainable buildings these “green buildings” are highly searched for. The EU Parliament has decided that new buildings in Germany starting from 2021 have to meet stringent efficiency requirements. Public buildings have to meet these requirements already by 2018. Christoph Marloh, President and CEO of Grundbesitz24 GmbH prognoses, that within approximately ten years in Hamburg, Germany’s green capital, the total monthly rent of not renovated buildings from the 1960s, in an average residential area, considering the ongoing energy inflation, could reach at a level of 16 € per square meter. For the residents living in such areas such a cost increase would be unaffordable. A lot of the buildings which will exist in fifty years and later are existing already. If these existing buildings won’t be modernized within the next years, the markets demand wont be meet, even if all new buildings were built to be sustainable from today onwards. Based on theses facts and additional significant increases in financial profit and long-term competitiveness, it is necessary to lower the energy consumption of older buildings within the next years. In Hamburg a great opportunity is offered to investors by investing into these older residential buildings with the goal of a more energetically sustainable management. Beside reduced maintenance costs and higher rental income, the intrinsic value of such a “green building” rises. Two very profitable closed-ends funds are offered by Grundbesitz24 GmbH. The first one is a return-fund “Renditefonds Nord”. Analysts confirmed that this return-fund has a “solid conception” as well as an “above average income security.” Minimum investment for this fund is 200.000 €. The second one is a retail fund “Nachhaltige Wohnimmobilien Hamburg 02”. The minimum investment is 10.000 €. Funds regarding sustainable residential properties are already in planning status for Berlin and Munich. Grundbesitz24 GmbH modernizes buildings that are not older than approximately fifty years through energetic upgrades to lower the energy consumption up to 80 %. Because of its great commitment, Grundbesit24 GmbH recently was rewarded with becoming an environmental partner of Hamburg. There are of course many different options of how to make these buildings more “green” and lower their energy consumption. Efficient windows, solar thermal systems, effective heat-insulating outer components, and modern ventilation systems are just some of the existing options. For example installing heat pumps for heat recovery, like the ones offered by the Finnish specialist named ENERVENT OY AB, represent green technology. Heat recovery is a way of ensuring that heat is recovered from exhaust air and returned for use inside a building rather than being lost to the outside air. The results of making a building “green” are lower heating bills and better efficiency. Other benefits are a reduction of moisture and mold growth, more comfortable room temperatures, an improved sound insulation, an improvement in living comfort, and the use of renewable energy sources. So if you are considering the idea of investing money in the German real estate market don’t miss out this profitable investment opportunity.